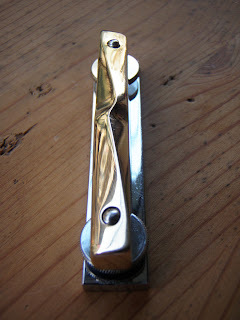 In the last blog post, we made a new nut for our vintage Hofner Colorama II. Also needing doing is an improved bridge. Apart from looking wrong (not necessarily a big problem), it has the wrong radius, wrong string spacing, and is not compensated in any way for proper string intonation. The base is almost correct, dimension- and look-wise, so I'm going to keep it and make a new top. Now turned over to check how close I got. Not bad. 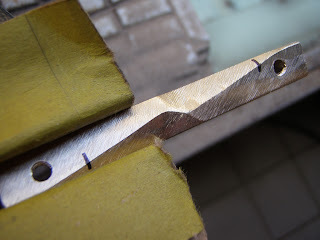 The brass is now filed to shape, checking constantly with the radius gauge to make sure nothing is going horribly wrong. 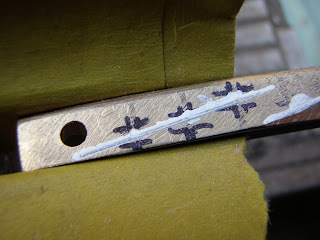 The guitar is then quickly strung up (I've been doing a few things in parallel here, so the guitar finish is done now - I'll do a post about that part soon), in order to determine how to shape the top of the bridge to intonate the strings correctly. 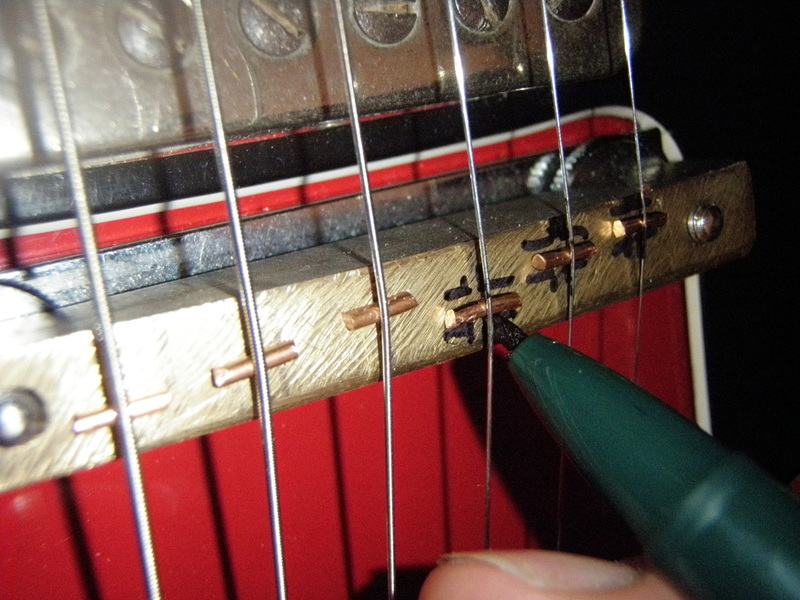 Then I check with a tuner and move the copper wires forwards or backwards until the strings are intonating properly, then mark the position with a pen. After that, I remove the bridge from the guitar and mark it with a couple of lines that will more or less cut through the six marked positions. There's a certain amount of compromising going on here, but it should still end up giving acceptable results. 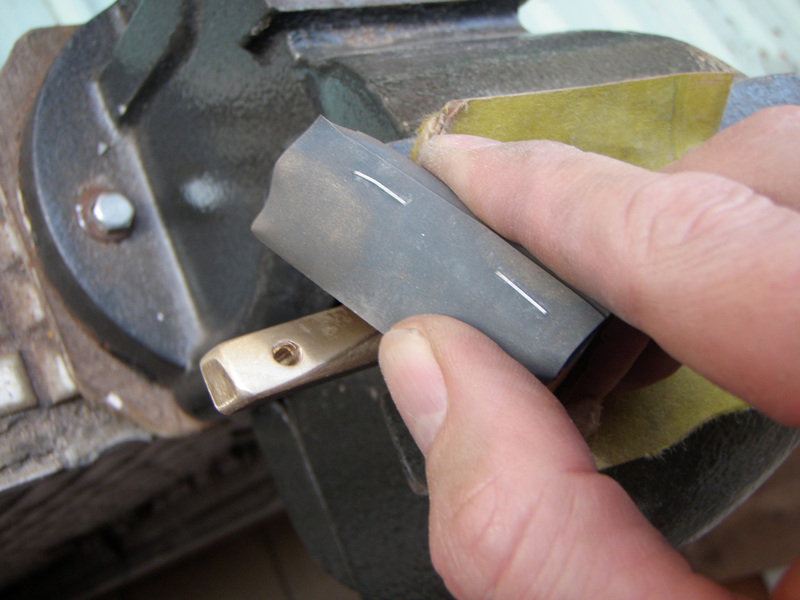 For the sides and back, I put the sandpaper on a flat surface and move the bridge itself. 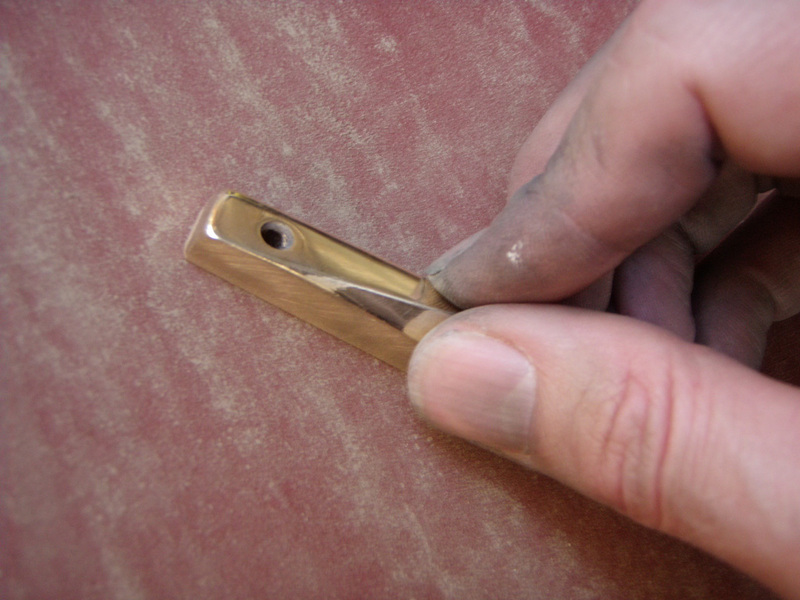 Other than that, it's the same finishing process, from 400 grit to rubbing compound. The aim was to follow a similar style to the bridge that would've come with the guitar originally, while correctly compensating it for an unwound G string (the original would've been shaped for a wound G string). I think it came out OK.
1. 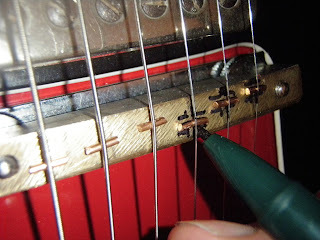 While re-radiusing the fretboard, more pressure was applied towards the middle of the neck in order to remove more fretboard material in that area. 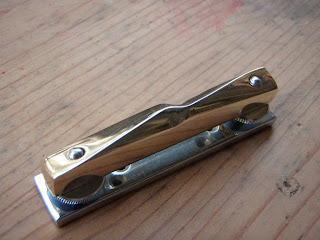 This would not straighten the neck, per se, but it would reshape the top of the fretboard in such a way that its top would end up being flatter. 2. 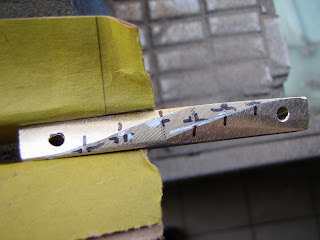 When refretting, the fret slots were widened. When frets are forced into narrower slots, this has a tendency to force the neck to back bow, so we wanted to avoid this at all costs. 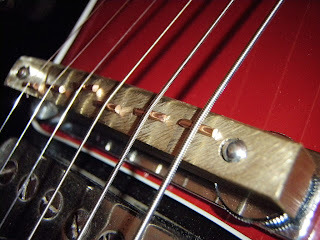 The slots are still narrow enough to grip the new frets, but are certainly not overly-tight. 3. Obviously the truss rod nut was slackened as much as possible. In fact, even with the nut removed, the neck still maintained a back-bowed shape. 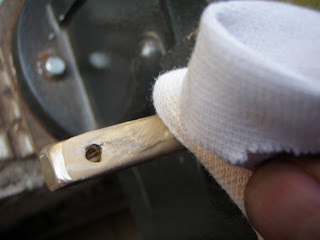 It was noticed that the washer under the nut was wedged into place, and it was suspected that it might be preventing the truss rod from properly slacking off. In other words, when the truss rod nut was tightened, the truss rod threads would pass through the washer, but when the nut was loosened, the threads might get stuck in the washer, leaving the truss rod in a tensioned state. After some time, the neck appears to have straightened out enough that we can consider doing a fret level and crown. Then we find something nice and straight with a flat bottom. 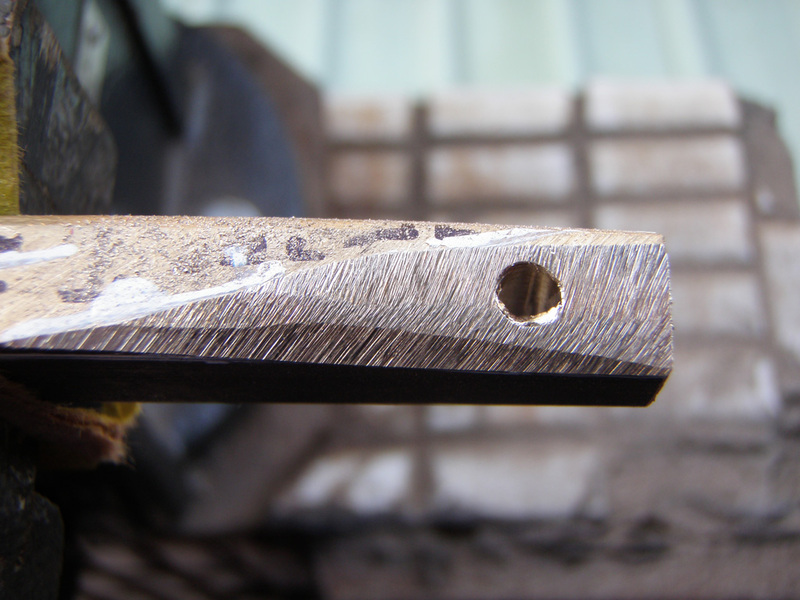 Don’t assume straight tools are actually straight, by the way. This spirit level has been confirmed as being straight enough for this job, and 400 grit sandpaper has been stuck along the bottom edge. Then we run the leveling tool up and down the fretboard, parallel to the neck, making sure to keep it straight, and giving each area (left to right) the same amount of attention. Next, we make the frets black again, and run a radius sanding block up and down a few times until the tops of the black marks are gone on every fret again. This is to ensure we haven’t inadvertently reshaped the curvature of the frets in the previous step. And here’s the end result. A super-flat, shiny fretboard. I can’t wait to use it.